Be inspired by Hedge Farm’s unique ambiance while hosting your next event at our venue. Your guests will enjoy Old Southern elegance surrounded by modern amenities. Visit today to see why Hedge Farm is the ideal location to host your next event. Hedge Farm promises to be an unforgettable setting for your wedding. Hedge Farm can accommodate up to 350 people depending on the type of event and layout. Wedding & Reception rates for 2019/2020 will start at $5,000.00 any day of the week. What is included in the "Venue" package to accommodate 150 guests? Wedding Ceremony Director for rehearsal, ceremony, and through reception to keep Bride and Groom on their timeline during reception. (specifics will be provided by Hedge Farm staff). What access does Client have with the "Venue" package to accommodate 150 guests? Access to Hedge Farm grounds starting at 8AM Friday for set-up until 2PM Sunday for break-down. Rehearsal Dinner time not included. Access to the Main House and Garden House (guest house) for Bridal Party to prepare for Wedding Day. Walk through one- two months before event- this must be set-up by Client. Venue cost for Rehearsal Dinner is five hundred dollars ($500.00). Client is responsible for catering, table linens, decorations, set-up, break-down, and clean-up at the end of the rehearsal dinner. 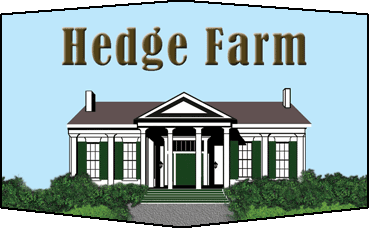 For more information, please contact Hedge Farm. For pricing details for more than 150 guests, please contact us. Full Service Weddings available upon request & availability.